I have some favorite words. I’m sure you do too. There are a lot of words I like for the way they sound, like STEADFAST! What a great word! I want to be steadfast. There are other words I like because of what they represent like “breakfast.” I’m a big fan of breakfast – any time of the day. I also like the word meat because… well… I like meat! And when you put certain words together, it’s even better – Breakfast Meat! Are you hungry yet? As I think it over, it’s more than mere words that bring me elation, but rather it’s what they represent. If I had to choose between using the WORD “breakfast” or eating a REAL breakfast that was sitting right in front of me, I’d pass on the mere word and dive into the eggs, waffles and bacon! Substance is always preferred to mere words. It must be this way with God, too. We talk a lot about worship, but is it the word or the concept that we love or do we demonstrate to God how much we love Him? We love to sing about worship, but do we worship? Does our worship have substance? Just as I prefer a real breakfast to the mere mention of the word, God’s desire is that we truly worship Him rather than just talk positively about it. We understand that it is not enough to say that we love God and will obey Him. We have to actually OBEY Him. Worship is loving God. How does God expect us to show our love? Obedience. The words Worship-Love-Obedience are meant to be used together. Take away any one of those words and worship becomes something less than substantial – mere words. However, if we say we love God, but do not obey Him, the Bible calls us liars! 1John 2:4-6 If someone claims, “I know God,” but doesn’t obey God’s commandments, that person is a liar and is not living in the truth. But those who obey God’s word truly show how completely they love him. Those who say they live in God should live their lives as Jesus did. I don’t mean to be harsh, but there are only two things we can do as people who claim to know Jesus. Be a Lover or be a Liar! Holy God and my Father, I desire to be a true worshiper, though I know that I have failed to obey You so many times. Other times I have obeyed out of duty and hated it because my love was for myself and not for You. And at times I have merely gone through the motions of worship with my mind disengaged from Your presence. Forgive me for my half-heartedness. And help me so that my Worship and Love show through in Obedience and my Love and Obedience make complete my Worship and let my Worship and Obedience demonstrate my Love for You. amen. We know our time on this earth is brief. Scripture declares it and we see evidence everyday that life is short. It would be such a waste to live that life only for ourselves, especially in the light of Eph 2:10. God has made us His masterpiece. He specifically designed us to do the “good things” and he planned these “good things” long ago specifically for us. WOW! Another verse – This one’s a favorite. Galatians 6:9-10 “So let’s not get tired of doing what is good. At just the right time we will reap a harvest of blessing if we don’t give up. Therefore, whenever we have the opportunity, we should do good to everyone – especially to those in the family of faith.” YES! do good to everyone, ESPECIALLY other believers and DON’T EVER STOP doing good. I believe that all of us want to do good. But, in a world turned upside down, where evil is declared good and good is deemed offensive, it’s difficult to know where to begin. Do you lack ideas in your personal campaign to do good? Here are some starters. Tithe to your church and then give above that. Find a place to serve within your church and then find a 2nd place to serve. Go to Bible Study and Worship faithfully, then stay a little longer to encourage others. Too easy? Scripture does say “especially to those in the family of faith.” We can’t just ignore that because it seems obvious. We are biblical to start with these three things and springboard from them. Now for the “don’t ever stop” part of the Galatians instruction – But lunch for a friend. Serve the meal at a homeless shelter. Invite friends over to dinner. Send someone an encouraging message on facebook. Send an elderly widow a bouquet of flowers. Rake your neighbors yard when he is out of town. Have a Daddy/Daughter date or a Mother/Son date. Tell someone that Jesus loves them. Hold the door for a stranger. Sponsor a child. Help an elderly shopper with his/her cart. help a friend with a repair. Tell someone they are doing a great job. Tell others that you love them. Make A Difference. Have you ever sat in a restaurant and, overhearing the conversation at the table next to you, wish you could pull up a chair and listen, or even join in? Today, at lunch, I overheard five men who were engaged in a conversation regarding the worship at their church. Scratch that. Two men were talking and the other three were listening. Four, if you count my wandering ear. But I really couldn’t hear everything that was said. You see, the music in the restaurant was too loud… (irony? )… maybe. So you understand why I wanted to pull up a chair? From what I could make out, the man doing most of the talking was expressing his resistance to the addition of guitar and drums. He didn’t seem angry, just resistant. He admitted that there was nothing “technically” wrong with guitar and drums in worship. It’s just that he was, well, uncomfortable with them. He didn’t like it. He said He found himself gripping the back of the pew as they all stood and sang along and when the songs were over and he could let go to sit down, he felt relieved. He seemed to regretted how he felt, but he wanted to be honest about it. His friend was trying to encourage him, saying that the church needed to be relevant to the culture. He seemed to agree and commenced to chase a rabbit wondering if it was society in general that rubbed him the wrong way; too noisy, impatient, self-absorbed, performance oriented. And he just didn’t want to see that happen in his church. My mind wandered after that and it sounded like their conversation did too. I found myself thanking God that theirs was a pleasant conversation between brothers and that there was a “Truth in Love” aroma to it (and a hint of moo goo gai pan). As a worship leader veteran of 18 years, I may have heard it all; all the complaints, criticisms, humble questions & sincere support. I’ve received my share of anonymous letters; “God hates rock music” “Rock music has no place in the church” “drums are a tool of the devil.” Some of the most non-biblical statements I’ve ever heard within the church have been about worship. And I think all our self-righteous and self-wrongness about worship comes down to us using a wrong criteria when we evaluate worship. 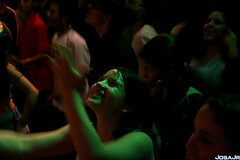 How do we evaluate worship? This is a tricky business. First, let me say, as a worship leader, I’m appreciative of every compliment I’ve received over the years. Please don’t stop. Your loving words are a wonderful encouragement for me. I love my calling and my job. And I love the people that God, in His grace, has allowed me to serve over the years. It seems to me that most of our evaluating statements regarding our worship services utilize the words “like” and “I” a little too often. Now, I’m not offering condemnation here. I want to be a better worshiper! I don’t have all the answers. I’m still looking and learning. I’m seeking here, to discern the premise of our worship evaluation. I think every worshiper would agree that we worship because God commands us to in His Word. And, moreover, we would probably agree that we worship because God is deserving of our worship. Why then, when we evaluate worship, do we seek to resolve whether or not WE “liked it?” Shouldn’t we be asking God what He wants? Our worship evaluation gets off track very quickly if it doesn’t begin with this question; “God, how do You want your people to worship You?” If we first seek to satisfy this question we are led to verses like Psalm 51:17 “The sacrifice you desire is a broken spirit. You will not reject a broken and repentant heart.” When was the last time you and I left worship with a broken and repentant heart? We are also led to verses like Romans 12:1 “give your bodies to God because of all he has done for you” OUR WHOLE SELVES!! “This is truly the way to worship him” Do we come to worship service seeking to offer ourselves to God? Or are we interested only what we can get from it? Are we looking for a tingly feeling and calling it worship? We should be throwing our lives at His feet, begging and pleading to give Him more, all of ourselves. Instead, we can’t get out the door fast enough when worship is over. We start checking the clock on our phone fifteen minutes into the sermon. We prefer to sit instead of stand through the singing because our feet hurt or our back hurts or we stayed up to late last night. We worship a Savior who had nails hammered into his feet and hands and we can’t stand for 10 minutes of singing to Him? Or sit through 30 minutes of Bible teaching? What must God think of that kind of worship offering? No wonder we don’t asking Him if He felt worshiped. We probably wouldn’t like His answer. The growing intensity of my tone here is meant to reveal that I long to be that kind of worshiper. If we are going to Love our God Deeper, then He will shine through in the way we worship and the way we think about worship. Father, oh how easily my eyes drift from You. Forgive me when I’m more disheartened by the lack of singing than I am by missing the presence of Your Spirit. And when I’m more impressed by loud singing than by the greatness of You, please forgive me. I am humbled in Your presence and I am a beggar, desperate for a few crumbs from Your table, yet you are inviting me to pull up a chair and sit in the place of honor with You as Your beloved child. Thank You for what Your grace means in my life. Do any of my thoughts here resonate with you? Are you needing a freshness to come back to your worship? I’d love to hear your thoughts. The following is a fictional memoir and does not reflect the attitudes of anyone I know personally, though it may reveal the inner struggles we are all trying to overcome as we become the church He died for us to be. Worship to day didn’t do much for me. I wasn’t inspired. Worship is there to inspire me and motivate me and I just didn’t feel it. People around me were raising and clapping their hands. A couple in front of me stood up and I couldn’t see. I mean, the worship leader did’t even ask us to stand up. I was doing it right and they were doing it wrong, yet they seemed inspired and I went away feeling worse than before. To me church should be about helping me be successful as a person. I mean, God wants me to be successful right? That way I can show him how good I am. Being more successful means I can upgrade my wardrobe. As I dress nicer for church, people will know that I really love God. When we dress nice for church, it’s like we’re telling God “thank you for the blessings,” right? I want Him to be proud of me and pleased with me. If I’m successful, then I’ll give credit to God. Wouldn’t he want that? The pastor kept saying that as “jars of clay” in the hands of God there will be no doubt that the power comes from him. Then he read from Luke 9:24-25 “For whoever would save his life would lose it, but whoever loses his life for my sake will save it. For what does it profit a man if he gains the whole world, and loses or forfeits himself?” I couldn’t make sense of this, because God gave me this life, why would he want me to give it up? That doesn’t seem like good stewardship to me. And I KNOW for a fact that God want’s us to be good stewards. He said so. I think it’s in Genesis or Deuteronomy. Lose my life for God’s? On purpose? That’s just not the kind of message I’m looking for. What’s in that for me? I’m looking for a church where I can feel good about myself and my ambitions. I think God wants me to feel good and be successful for Him. This “jars of clay” idea just doesn’t fit my idea of God. I think I’ll have to look elsewhere for the kind of inspiration I need. I don’t mean leave the church! Good heavens, no. I have some really good friends there. They’re humble, simple people, never who complain about what they don’t have, but give thanks for what God has given them. They are true servants. If I had a nickel for every time they brought me a meal when I was sick or when our baby was born or my mother passed away, well then I’d have a lot of nickels. I’d probably be able to start tithing! Ha-Ha- I’m just kidding. Anyway, I wonder why worship can’t get me inspired enough to be more like those people. I guess God just hasn’t opened the right door yet. For now, I’ll just have to rely on myself for my own inspiration and work my hardest to get ahead in this world to make God proud of me. Do you find anything here that resembles your own struggle to understand who you are to be “In Christ?” Do you value your own success. Do you devalue the “jars of clay” in which God has chosen to store His richest treasure – (you)? “These people say they are mine. is nothing but man-made rules learned by rote. When we surrender, this is what we are giving up. Nothing good lives in me (my sinful nature). That should be easy to surrender because I don’t even want that. Why is it not? So we MUST surrender. It is a prerequisite to worship. The very act of worship is acknowledging the object of your worship to be what you are giving your life to. When we give our life to Jesus, it is an act of worship. When we give our will to the Father, it is an act of worship. Too many times we define worship as a “feeling” or “emotional expression.” It is NOT. While feelings and emotional expressions may be byproducts of this act of worship, they are not themselves the definition of worship. Let’s think of it this way; Surrender and Obedience are the opening act of worship. Thanks and Praise and Songs are what follows.